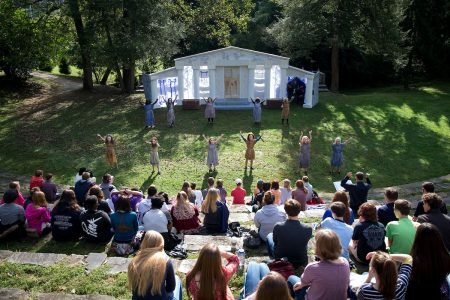 When Jarred Scott ’22 first heard about Randolph College, he was intrigued by the opportunity to pursue his passion for the creative arts and to experience the Greek Play. Soon, he was helping 3-D print molds for masks to be used in Randolph’s fall 2018 production—before he even started his fall semester. Scott and the rest of cast and stage crew are preparing for the 2018 Greek Play, Medea, which opens in the Mabel K. Whiteside Greek Theatre, located in The Dell. The performance is free and open to the public and opens October 5 at 4 p.m. Randolph’s Greek Play has a long history and uses authentic Greek drama practices, including specialized masks and a chorus. The production also coincides with the fifth Conference on Ancient Drama in Performance, which hosts classics and ancient drama scholars from around the world. Both the Greek Play and the conference are part of the College’s Center for Ancient Drama. The play tells the story of Medea, the daughter of the man with the Golden Fleece for which Jason and the Argonauts are searching. Jason successfully takes his treasured Golden Fleece with the help of Medea, and they fall in love. They return to Greece, where Medea goes on to save Jason from his evil uncle who is trying to kill him. Then, they settle in Corinth. Jason and Medea go on to have two sons, but shortly after, Jason decides he would be better off marrying the princess of Corinth. After Jason leaves her, Medea and her children are banished by King Creon. Angry and betrayed, Medea takes drastic action in her quest for revenge. Greek Play Director Amy R. Cohen, who is also a classics professor and the Catherine Ehrman Thoresen `23 and William E. Thoresen Chair of Speech and Theatre, hopes to show audiences Medea’s motives and the pain that causes her to follow through with her plans. Medea opens Friday, October 5 at 4 p.m. in the Mabel K. Whiteside Greek Theatre. Repeat shows are scheduled at the same time October 6 and 7. No tickets or reservations are required, and the production is free and open to the public. The rain location is the Houston Memorial Chapel. “I wanted to be in the Greek Play because I knew it’d be quite the unique theatrical experience. I was intrigued by the masks, performing in The Dell, and the play itself! I knew that if I were to participate in such a production, I’d learn and grow a lot as an actor. “My favorite part of being in Medea are all the characters that I play (nurse, Creon, Ageus, messenger). It has been quite entertaining to come up with four different personalities for these people. I especially like playing the decrepit old nurse. She’s a fun lady. I also love the messenger speech because it’s super gruesome. Another aspect of the play that I love are the masks. Wearing a mask is just fun. It’s like you’re completely transforming into your character. One truly feels like a different being when they wear a mask. “I personally wanted to try out for the Greek Play because I loved acting and wanted to get a window into acting in college. Since this would only happen a couple of times during my time here, and I have a light schedule being a first-year, I thought this would be a good time to try this out. “The Greek play was actually one of the determining factors in my decision to attend Randolph. As a classics major, I wanted to participate in the production because it provides a very unique opportunity to make the ancient world come to life in a modern context. During the play, we learn a lot about Greek culture and get to be a part of the rich tradition of Greek theatre, while still remaining relevant to 21st century audiences. I have also been involved with various plays and musicals throughout my career, and I wanted to experience a different type of production and to observe how drama has evolved. “I’ve always been obsessed with Greek mythology and I am a lover of music, so it seemed like a pretty easy decision to try out when I saw the flyers calling for auditions for Medea. “My favorite part of working on Medea has to be a tie between learning everything I’ve learned during my time working on this project, including things I never thought I’d learn from making masks for a play, and meeting all the people connected to the play and how warm and welcoming they have been. Professor Cohen is absolutely the mother of the Greek Play here at Randolph, and everyone who participates will always be one of her chicks, even after graduation.